We want you to know how pleased we are that you are considering our church for your marriage ceremony. A marriage ceremony is a very special service of worship for the couple, for their families and for their friends. Thus, the church is concerned with making sure that this special worship service which you are considering will be a significant moment in your lives as well as an appropriate service of worship for this church. The essence of marriage is a covenanted commitment that has its foundation in the faithfulness of God's love. The marriage ceremony is the glad occasion on which two people unite as partners in the mutual exchange of covenant promises. The one presiding acts as an official representative of the church and gives the marriage the church's blessing. The congregation joins in affirming the marriage and in offering support and thanksgiving for the new family. As a service of Christian worship, the marriage service is under the direction of the minister and the supervision of the elders of The First Church in Albany. To help you plan for your wedding and to know the traditions, requirements, and expectations of the church, we have prepared this guide. It is our joy to work together with you to make this one of the most special and meaningful days of your life. In accordance with our commitment to be a welcoming and affirming congregation, we perform weddings for all couples of faith, regardless of gender. Approximately 6 months before your preferred wedding date, call the church office and indicate your interest in being married at the church. You will be given this guide, the schedule of fees for weddings, and a wedding application form. Return the completed and signed wedding application to the church office. After it is received, you will be called by the pastor to schedule a time to meet to discuss your wedding plans. If you wish to invite a visiting pastor to also be involved in your wedding, please inform our pastor. You may ask the church coordinator to pencil-in a tentative date for the rehearsal and wedding service on the master calendar of the church. This date remains tentative until after the couple has sent in their deposit and has completed pre-marital counseling sessions. Those desiring to be married at The First Church commit themselves to a series of pre-marital counseling sessions with the pastor or, in the case where their own pastor is officiating, with their pastor. This consists of two to three one hour conversations. The first is an initial planning session, the second is a conversation about the marriage relationship, and the third, if needed, is a combination of counseling and planning. Additional sessions may be scheduled if the pastor feels this is needed. All arrangements should be deemed tentative until the premarital counseling has been completed. The Liturgy of the Reformed Church in America provides an "Order for Christian Marriage." As a service of Christian worship, the marriage service is under the direction of the minister and the supervision of the consistory. In the presence of God and the company of family and friends the couple marries one another by making a public commitment to each other with their vows, by exchanging rings, and by joining hands. In consultation with the pastor, you may want to develop a service which will uniquely express the meaning of your marriage. The pastor is prepared to work with you in developing such a service, which might include writing your own vows, including guest readers or musicians, the selection of favorite readings, or other modifications. truly, with all my heart. "As long as we both shall live" is the commitment the bride /groom /partner make to one another. Whatever your past experience, you are now making a commitment to stay together for the rest of your lives. You are giving your word to one another that, whatever happens, the relationship is not at stake: You are promising to remain married. A wedding at The First Church is a Christian service of worship. We presume you desire to be married in a church because you are a person of faith. The wedding is a time of praise, prayers, and invoking God's presence and blessing. If you are not comfortable with a wedding in the context of a community of faith you might consider requesting information from your town/city clerk about others in the state who can officiate at weddings. 1. Obtain a) this guide, b) the wedding application form, and c) the schedule of fees from the church coordinator. Return the completed and signed wedding application to the church coordinator. 2. The pastor, upon receiving your application, will call you to schedule a time to meet. At that interview, dates will be discussed but remain tentative until the premarital counseling process has been completed. 3. The pastor of the church will officiate at all weddings that take place at The First Church in Albany, unless for some reason that is not possible. Guest clergy (e.g., relatives or friends who are pastors) may be invited to take a part in the service, but only at the invitation extended by the pastor of The First Church in Albany. 4. The organist is responsible for all wedding music. If unavailable for any service, the organist will make other arrangements in consultation with the pastor. If you wish to use a soloist or guest instrumentalist, please consult with the organist before making arrangements. 5. All participants are expected to be present and on time for the wedding rehearsal. Bring with you: the marriage license and any special items to be used. Allow one full hour for the rehearsal. 6. You may wish to preview the premises if you are unfamiliar with our church and its facilities. The building is normally open 8 a.m. to 3:00 p.m. Monday through Friday. 7. Flash pictures may not be taken during the ceremony, either by guests or by a professional photographer. Your photographer may take flash pictures during the Processional and the Recessional, and may take available light photos during the service from the balcony or any other vantage point out of sight of the congregation, if done in silence. Photographers (or others) may not walk around or be up front during the service. Please request your photographer to consult with the pastor prior to the service. 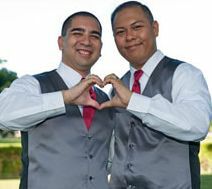 Consider whether you would like most of your photographs taken before or after the ceremony. Some wedding parties favor taking photographs before the ceremony to insure that all members of the party are present and to avoid long delays between the ceremony and the reception. Video taping of the ceremony may be made from the balcony with available light. 8. A printed order of the marriage ceremony is not necessary, although it can be helpful to your family and friends as well as a keepsake. Please be sure to consult with the minister if you wish to have a printed order of the service. 9. Since the beauty of the sanctuary is its antiquity and simplicity, floral decorations are best kept to a minimum. Decorations on the end of pews are not permitted. The church can recommend a local florist, or you may use one of your own choosing. 10. Birdseed, confetti and rice may not be used inside the church buildings or elsewhere on the premises. Bubbles may be used outside only. 11. Alcoholic beverages of any kind are prohibited on the church premises. 12. Smoking is not permitted in any part of our buildings. 13. Food and beverages are not permitted in the Sanctuary. The main Sanctuary seats over 500 people without using the balconies. It has a center aisle which is approximately 60 feet long. Zimmerman Hall, downstairs, is served by a fully equipped kitchen. This area is suitable for wedding receptions of about 100 people, subject to a set fee and specific regulations governing its use. James Chapel seats about 80 people and is thus appropriate for small weddings. The parlor can facilitate a small reception. It has a kitchenette. __ Get and read this guide, application, and fee schedule from the church coordinator. __ Return completed and signed application to church coordinator. __ Meet with pastor (pastor will call you after receipt of Application). __ Schedule follow-up sessions with pastor. __ Call the organist to discuss music. __ Contact florist. Explain to florist when and where to deliver all arrangements. Make sure anyone preparing decorations or flowers understands church wedding policies. __ Contact photographer. Inform of church wedding policies. __ Plan and schedule reception. __ Obtain marriage license(s). You are responsible for complying with all state laws in application for the license. __ Deliver marriage license to pastor at rehearsal. __ Take a deep breath, relax, take charge of your own wedding. Don’t get so stressed out that you don’t enjoy your own wedding. We will all work together to make this a beautiful and significant ceremony for you! Additional charges for extras such as candles, soloist, bulletins. Interested in having a wedding ceremony at The First Church in Albany? ​Please fill out this contact form and we will get in touch with you soon.